Easy! You can get a 10% discount on your storage unit auction list subscription using this coupon code: Auctionkings1.Visit Storage Unit Auction List and make sure to pop in your coupon code: Auctionkings1 during checkout to receive your discount! It’s that simple. Depending on your location, your subscription could cost as little as $5 per month. Every month, you will receive a freshly updated spreadsheet listing every upcoming storage auction near you, including all the contact info, times, addresses and more! Alternatively, you can call the friendly folks at Storage Unit Auction List at 1-800-353-8417 for personal service. If you’d like to learn more about how their service works, just click here. Yes! Self-Storage auctions are, by law, open to the public. This means anyone and everyone can attend. Check your local paper to get listings for self storage auctions happening near you. Although these special sales are open to the public, every facility has its own rules regarding conduct and bidding. Please check with the manager at the facility you are attending to learn more. That really depends on you. Is your day job profitable? Not if you only show up for a few days every week and foolishly spend all the money you make. Profiting from storage auctions is definitely possible, but it requires dedication, patience and discipline. If you can get organized, attend many auctions, buy low and sell high and work hard, you can make great money from storage auctions. Not usually – or at least they shouldn’t be. Most self storage companies and managers are very wary or opening up auction units before the sale, so as to avoid any nasty liability issues. However, most state lien laws require that the manager and an assistant or witness process the unit for auction. This means cutting the tenant’s lock, opening the door (not touching anything) and taking a general written inventory of the unit from outside. Pictures are also taken, then an auction tag and a company lock are placed on the unit prior to the sale. This auction tag cannot be removed without being broken, and it is broken in front of the auction buyers to indicate the unit has not been tampered with. Yes, generally speaking the round disc locks are much safer than your average run of the mill padlock with the u-shaped bolt. This is because the disc locks have shortened bolts which are hardened against cutting and basically impossible to get through using bolt cutters. The outer armor of the disc locks also makes it difficult to penetrate them with anything other than an angle grinder or special drill bit. When using an angle grinder, someone proficient in lock removal can destroy the lock in a couple of minutes, but the process is loud and messy. Yes and no. Yes, many of the things they find inside the units on shows like Storage Wars and Auction Kings were actually left behind by delinquent buyers, and yes, most of the time they sell for a great deal of money. What isn’t exactly true to life about these shows is the frequency with which they are shown finding the Big Scores like vintage coca-cola machines, cars, night-vision equipment and the like. Show producers have explained that they have to film an insane number of auctions in order to cobble together a couple of sweet scores in order to make up an episode. In all honesty, no. 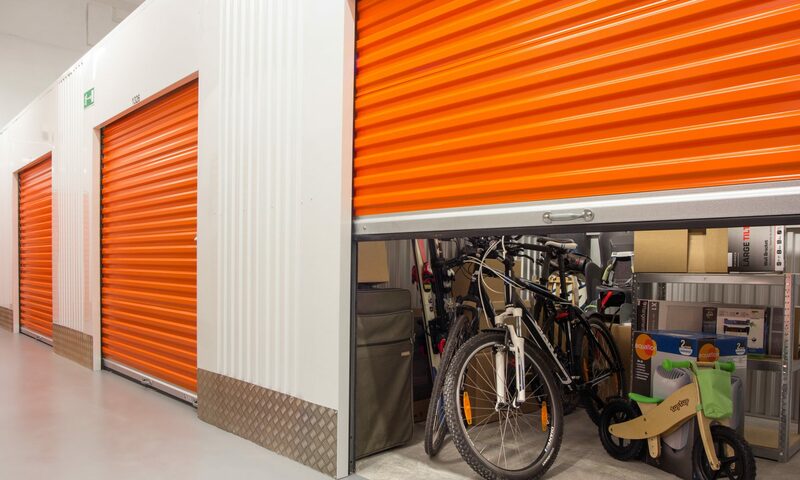 If you make storage auction buying a regular hobby or side job, you are definitely going to come across a few units that are simply stuffed with total junk like dirty moth-eaten clothes, moldy tools and equipment and personal photo albums that are of no use to you. However, this ultimately doesn’t matter if you follow the best practices outlined on Storage Auctions Kings for turning your local storage auctions into a profitable side business. If you continue buying low and reselling intelligently, you will make money. The great items you sometimes find, like jewelry or collectibles that are worth a lot of money are just the icing on the cake. Spike TV’s Auction Hunters Ton and Allen sometimes put a few of their more interesting scores up on eBay where anyone can bid on them. In order to find their storage listing, check out this link to the Auction Hunters eBay store. Keep in mind that sometimes their store contains no items because the previous offering will have already sold off. Just check back in a couple of days. Although each company, facility and manager may have their own auction day rules, there are a couple of big general no-no’s you should be aware of if you’re heading out for your first storage auction. For one thing, don’t ever set foot inside the units. They do not belong to you, even when the door is opened for you to look inside ,and you could risk trespassing, especially if you are obnoxious about it and you provoke the ire of the manager handling the auction. Scarily enough, most of the guns found in storage auctions get quietly pocketed and kept by their finders. After all, most property managers don’t have to time or inclination to sit and watch every auction buying clear out their unit. If, however, the company becomes aware of the firearm before the unit is sold, they may make an issue of it. Depending upon your state’s firearm laws and the type of weapon that’s found, you may either be on the hook to legally register your new weapon in your name, or otherwise surrender it to police if you don’t want it. For example, in Maryland, a shotgun is not considered a controlled weapon (the laws allow 18 year olds to purchase rifles and shotguns) whereas all pistols and concealable weapons are controlled firearms. If you find a rifle or shotgun, it’s yours. If you find a pistol and someone else knows you found a pistol, you’ll need to register it with your local law enforcement. This is really impossible to say. One guy that was an old auction buying pro told me he cleared 17K of profits after 6 months of buying up delinquent storage lockers and reselling this goods inside. This was 17K AFTER all associated storage fees, gas, and the rest. Others slog away at storage auction buying for a couple months and never seem to turn any profit. Either they get lazy once they get home with the goods or never seem to catch a lucky break with a nice juicy profitable unit.